America's greatest sports car, America's new F1 track, and America's only F1 driver take on history's greatest race car to teach us what speed means now. Ex-Jalop John Krewson delivers the May 2013 Road & Track cover feature. We’re standing by the track, at the beginning of the esses, as the most important race car ever built whips by on its first lap. It’s a 1967 Lotus 49, the greatest Formula 1 car in history, the machine that changed road racing more than any other. And on top of that, as it pitches under braking and the driver’s hands dart up and this animal yowl cascades from its exhaust, the Lotus is simply beautiful. In a moment like this, it’s tempting to say that it could be 1967 all over again. 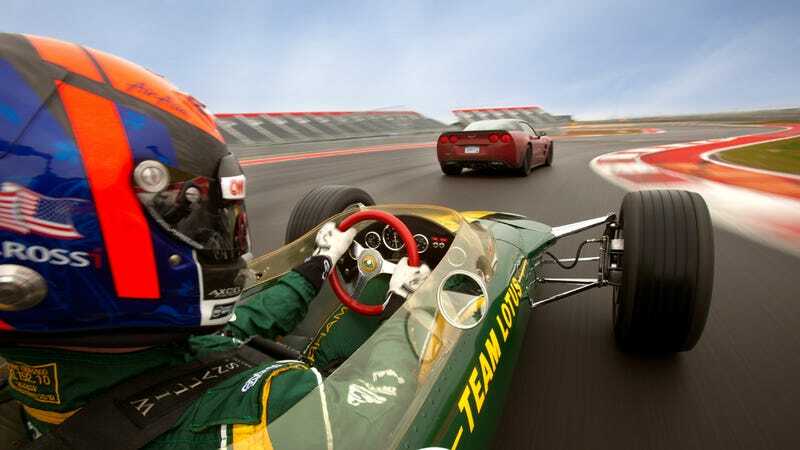 But the man behind the wheel is Caterham F1 test driver Alexander Rossi, 21, currently the only U.S. driver in F1. He is young and confident and has never driven a car like this. Rossi is screaming around the weeks-old Circuit of the Americas in Austin, Texas, the first and only purpose-built Formula 1 track in the United States. And we’re here to see if this 46-year-old Lotus is faster than the best American supercar money can buy. No, it couldn’t be any other time than right now. Read the whole thing at Road & Track, and check out the onboard video of the 49 at COTA below. No talking. No music. Just that Cosworth wail.